Bring a medium pot of salted water to a boil. Add farfalle and cook according to package instructions until done then drain and set aside. Meanwhile, in a large skillet, over high heat, saute bacon until browned (3-4 minutes). Remove from heat and use a paper towel to soak up most of the fat. Place skillet with bacon back over high heat. Add garlic and saute about 1 minute. Add heavy cream to skillet and simmer for about 5 minutes. Add the peas to the skillet and return to a simmer. Cook about 3 more minutes. Add parmesan cheese into sauce. When pasta is ready, drain it and put it back into the pot. 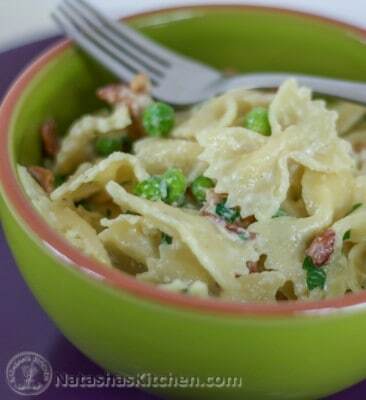 Pour sauce over pasta and stir in the chopped parsley. Enjoy!